STERPDB is a regional planning agency that provides specialized planning and technical assistance to member counties and communities across 6,239 square miles of rural upstate New York. 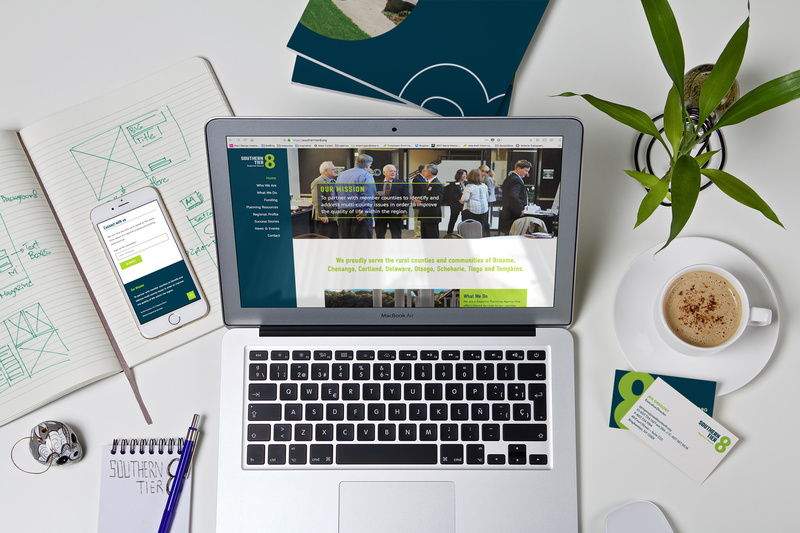 Southern Tier East Regional Planning Development Board came to Idea Kraft looking to overhaul not just their branding and website, but to actually rename the organization as well. The previous name was long, with various acronyms that were used inconsistently by different people. Our goal was to create a new name that not only represented the organization but was concise and memorable. Through various surveys, one-on-one phone calls with the leadership team and key decision makers, we were able to put together new options for them. These options were then streamlined until we had our final contenders. We then used these names as we began working up visual ideas for the logo. The new logo needed to be modern and professional and truly represent the goals of the organization. Based on the feedback we received from the initial research, we knew the name change was necessary. We explored different acronym-based names, in addition to names based on action words. We knew the focus should be on the 8 counties that the board serves. 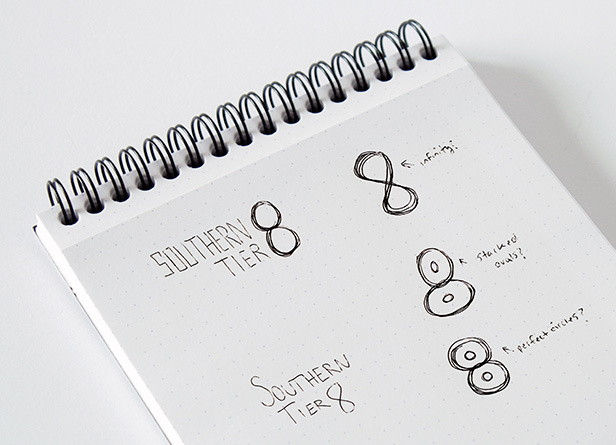 Ultimately, we settled on Southern Tier 8 Regional Board. ST8 was similar to the previous STE and we were able to gain approval from the board and keep everyone comfortable during the transition. 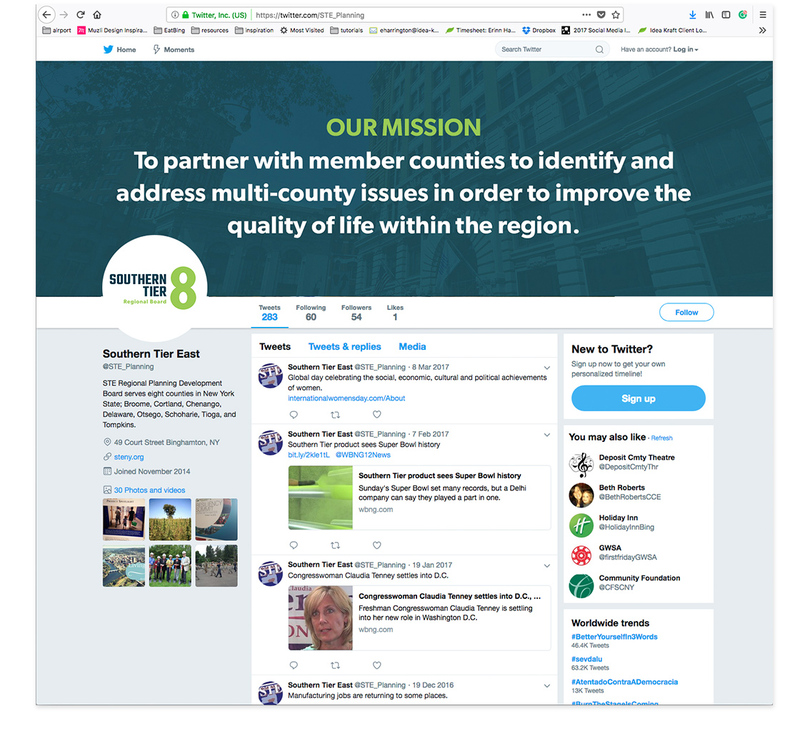 The new brand focuses on the organization’s mission and vision, and the new modern logo represents the partnerships and collaboration between 8 counties. The green and blue palette is fresh, vibrant and approachable. The colors represent strength, focus on sustainability and growth as well as a commitment to the Southern Tier region. 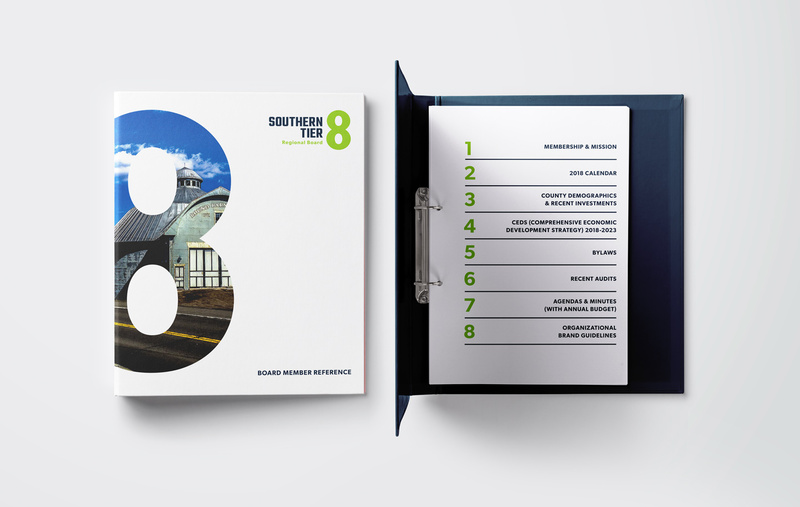 The typography is crisp and the new collateral materials are comprehensive and contemporary. 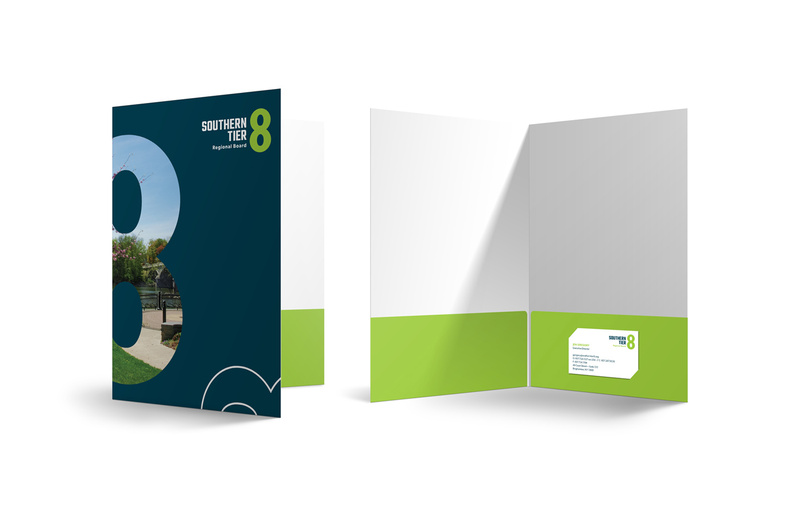 The new identity system included overview materials for board members, brand guidelines, business stationery, folders, banners, and signage as well as promotional materials and email templates. We used the collateral as an opportunity to play with a dynamic treatment of the logo. 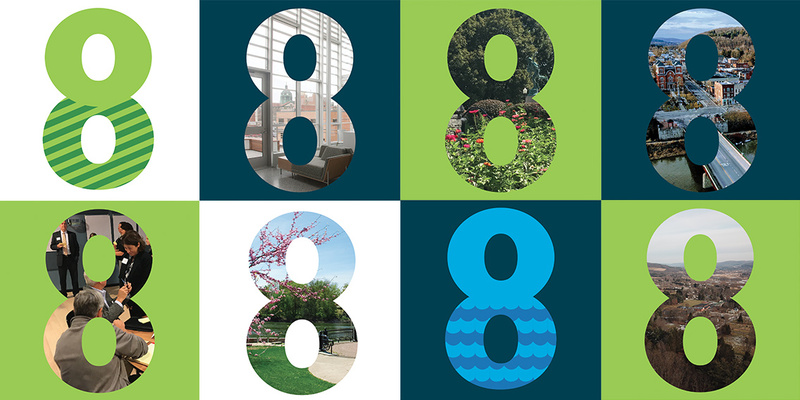 The bold “8” loaned itself easily into a blank canvas to showcase regional photography. This gave us the opportunity to depict imagery from the different counties. 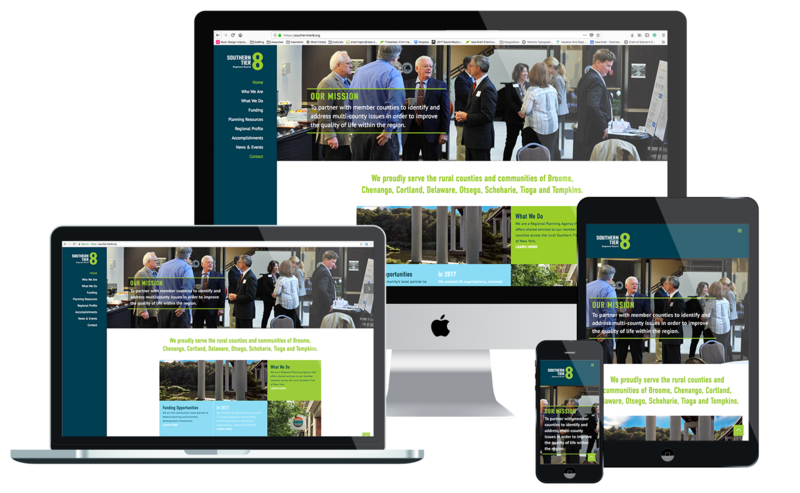 When approaching the new web design, it was important to provide a better user experience for the viewer. 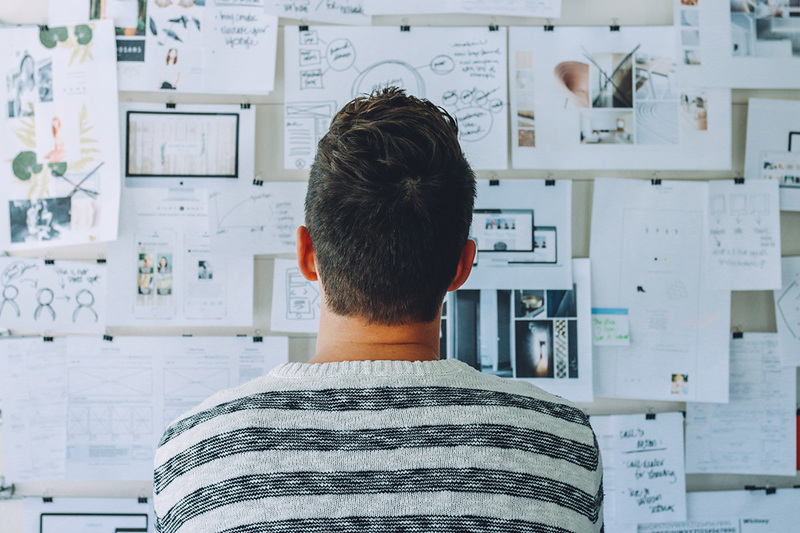 While the old site had valuable content, it was hard to navigate and did not engage the viewer. We resolved this by adding more imagery that reflected real people involved in the organization and landscapes from the region. This made the site more inviting to the user and encouraged them to dig deeper in the site. We also added a News section, where people involved in the organization could easily share content across social media platforms. The addition of an accomplishments page drove home the success stories the organization had been involved in, providing case studies of how their funding could be successful and really benefit the area.